First I sanded the entire surface and sides of the wood using my beloved Ryobi hand sander￼. Then I dusted it off with a soft brush. I added a coat of Bleached Sand. I thought about giving it a really good coat of paint, but I was pretty smitten with the way it looked with all the little nooks and crannies. So I just painted until I liked it. I ran a dry rag over the still damp paint. I wanted to removed any excess paint and dry it off, while giving it a more aged look from the start. I used a dry brush to randomly add Spa Blue. … and wiped it off, and just kept doing this until I was happy with the results. … and wiped it off, and just kept doing this until I was happy with the results. I didn’t want it to be dark, just a little aged. I let it dry overnight, then dry brushed some cocoa carefully over the starfish to make it a little darker and make it look a bit sandy. 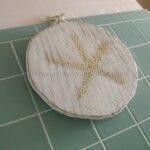 This project for Distressed Beach Starfish Plaque was printed from CraftsbyAmanda.com - https://craftsbyamanda.com/beach-starfish-plaque/ and can only be printed for education or personal use.